The exhibition is based on the simulation of the artist's participation in the International Expo held in Paris in 1937. The show, bringing back the hands of time up to 25 May 1937, proposes a mental journey through some manipulated historical documents, by which is possible retrace some of the highlights of the Paris Expo to discover the artist's pavilion and the works in it exposed. Designed as a historical re-exposure, the exhibition aims to connect our present with a precise time of the recent past to reflect on the violence generated by the absence of dialogue. La mostra si basa sulla simulazione della partecipazione dell'artista all'Expo Internazionale tenutosi a Parigi nel 1937. La mostra, portando indietro le lancette del tempo fino al 25 maggio 1937, propone un viaggio mentale attraverso alcuni documenti storici manipolati, mediante i quali è possibile ripercorrere alcuni dei punti salienti dell'Expo per scoprire il padiglione dell'artista e le opere in esso esposte. Pensata come una ri-esposizione storica, la mostra intende creare un collegamento tra il nostro presente ed un preciso momento del recente passato per riflettere sulla violenza generata dall'assenza del dialogo. AlbumArte, Via Flaminia 122. 00196 Roma. 2015 june 09th - july 29th. 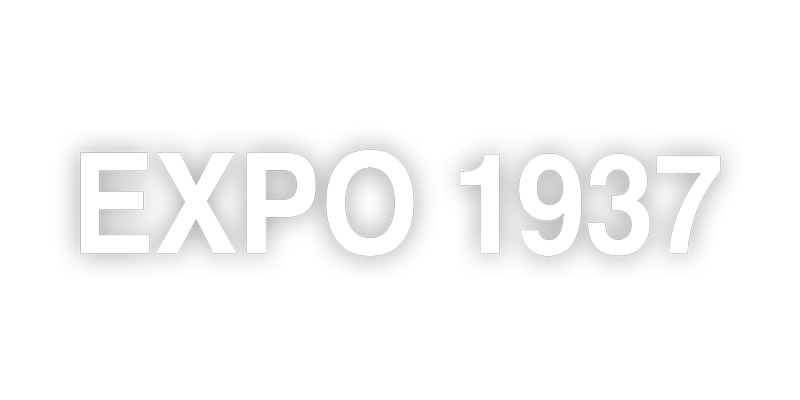 The International Exposition, dedicated to Art and Technology in Modern Life, was held from 25 May to 25 November 1937 and attracted 31 million of visitors. Organized in a great political tension time between the European countries, it was conceived to foster a climate of detente between them. The exhibition area was around the Eiffel Tower, and extended from Trocadéro to Champs du Mars, with some extension to the Pont de l’Alma and Ile aux Cygnes. More than a classic fair, the Paris Exhibition of 1937 is characterized by the imposing and spectacular architectures. All countries have intervened with their best architects: Hanry Van de Velde designed the pavilion of Belgium, the Finnish Aalto Alvaro, Junzo Sakakur the Japanese, Marcello Piacentini for Italy, Albert Speer for Germany and Boris Iofan for the USSR. The pavilion of the Spanish Republic was designed by the architect Josep Lluis Sert, and hosted by the way 'Guernica', the famous work by Picasso that denounced the tragic consequences of the bombing which involved the defenseless population of the Basque town. L’Esposizione Internazionale, dedicata all'arte alla tecnologia nella vita moderna, si tenne a Parigi dal 25 maggio al 25 novembre del 1937 e attirò ben 31 milioni di visitatori. Organizzata in un momento storico di grandi tensioni politiche tra i paesi europei, doveva servire nelle intenzioni degli organizzatori a favorire un clima di distensione tra gli stessi. L'area espositiva si trovava attorno alla Torre Eiffel, dal Trocadéro ai campi di Marte, con alcune estensioni verso il Pont de l’Alma e l'Ile aux Cygnus. Più che una fiera classica, l'Expo di Parigi fu caratterizzato per le architetture imponenti e scenografiche. Tutti i paesi intervennero con i loro migliori architetti: Hanry Van de Velde disegnò il padiglione del Belgio, Alvaro Aalto quello nlandese, Junzo Sakakur quello giapponese, Marcello Piacentini per l’Italia, Albert Speer per la Germania e Boris Iofan per l’URSS. Il padiglione della Repubblica spagnola fu disegnato dall’architetto Josep Lluis Sert, ed ospitava tra l'altro “Guernica”, la famosa opera di Picasso che denunciava le tragiche conseguenze del bombardamento aereo che coinvolse l'inerme popolazione della cittadina basca. Cancellation. Participation. Violence. Lucidity. These four words sum up the essence of the work of Gregorio Samsa, a single name for an anonymous artistic duo, who are presenting his new project entitled Where is Abel? in the exhibition spaces of AlbumArte. “Cancellation” refers to the erasing of the identity of the artist, who, beyond his obviously fictional name, until now has expressed himself exclusively through his works, (which include: Real/Virtual, 1+1=1, Hungry Ghost and Viaggiare Sicuri), adopting a practice of subtraction that refuses to please the eye of the spectator and always brings him abruptly face to face with stories and characters with a radically anti-narrative character. This original decision has placed the artist in a zone that coincides, in a radically original way, with a kind of minimalism combined with figuration. In the present project proposed for AlbumArte Gregorio Samsa makes a further cancellation, removing the faces from his self-portrait through a geometric structure that links the two bodies, in order to emphasise the renunciation of the principle of authorship. Why does Gregorio Samsa need to do this, and why does he not want to “be present”? Does he simply wish to remain faithful to his original intention of not revealing himself, or is there something more to it? This new project seems to require that he should operate in a state of clandestinity that goes beyond mere anonymity. In fact he has now turned his attention to a historic event: the International Exposition held in Paris in 1937, a time when initiatives of this kind seemed to promise a bright future of solidarity and brotherhood between different peoples and nations, although the darkness of the Second World War was already looming large on the horizon. 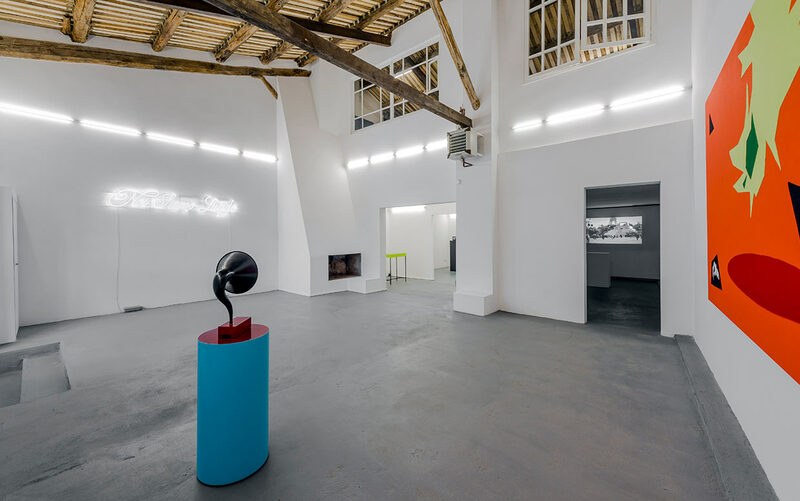 By means of a Situationist kind of manoeuvre, which replaces the identity of the artist with other (often unspecified) identities, Gregorio Samsa manipulates two original sources: amateur film footage of the 1937 Exposition and the official guide that was realized for the event. He contaminates them with his presence, which he now makes explicit by setting up his own fictional pavilion in the context of the real event. There is something clandestine in this strategy for being present, as it represents the violation of an ordered structure and an intrusion into a codified world, with its own rules and rituals intended to exclude any kind of unauthorized attendance or spurious presences. Anonymity and clandestinity are the necessary means for carrying out this manoeuvre, but it is then conducted explicitly, with vibrant directness. The pavilion does not have the name of any particular state or nation, but it expresses an existential and mental condition. In fact, its Italian title Noi Siamo Lucido (literally: “We Are Lucid”), combines the plural form of the verb with the singular form of the adjective, a “syntactic crasis” which expresses a plurality that is resolved within a single element. The structure of this pavilion is very different from the pretentious scenographic architecture of the others, which expressed a Zeitgeist that looked optimistically towards the future. Instead it is deliberately unattractive, with superimposed levels that form a massive ziggurat-like tower. It is crowned with a sort of self-portrait in the form of two huge blocks, like the blank squares that conceal and substitute the artist’s head in the photograph. Thus, at the summit of the ziggurat, where priests and augurs once scrutinized the sky and looked to the heavens in order to predict the future, there is now a quadrangular “head”, stubbornly concentrating upon trying to understand the present. Inside it we find the work that gives the project its name: Where is Abel? This is a tapestry of various images, with apparently reassuring colours. But in this collage of fabrics there is also a disquieting element: the head of Abel, which evokes the first murder in human history. At a first glance the tapestry and the gramophone that repeats the music from Sergio Leone’s film “For a Few Dollars More” seem innocent enough, but they create a dramatic tension by introducing the theme of violence, the sacrificial victim, and death. In addition the flag of the pavilion seems to be a black hole created by something that has fallen into it, although it is surrounded by colour. The hope for peace has been swallowed up in this banner, leading to an uncertain future and the destruction of a harmony that was in fact only imagined. This black hole expresses the absence of awareness regarding the present, which is just as valid today as it was yesterday. According to Gregorio Samsa the situation that we now face, when a Universal Exhibition is being proposed to deal with the modern emergency of “feeding the world”, or trying to redistribute its food resources and thus limit hunger, is not so very far from the situation in 1937. A similar threat of violence looms over us today. Although it is not manifested in an all-out war in the West it leads to equally brutal localized armed conflicts, mass emigration from war-zones, cynical oppression by transnational systems such as those of global banking and finance, the cancellation of individual rights, as well as systematic murder and the deletion of the past perpetrated in the name of religion. Innocent victims continue to suffer from violence and aggression, as Gregorio Samsa seems to tells us, although in his own language, which requires us to engage in an act of attention that goes beyond the reassuring appearances and that tries to understand the origins and the processes of violence. The artist responds to all this by adopting an active and participatory role, although one that is symbolic, as represented by his choice to participate in a Universal Exposition with his own pavilion. Nevertheless he clearly expresses his position by saying “We Are Lucid”, with brightness, light, and an awareness that attempts to understand the present.